Nearly 700 people attended Trinity’s tenth annual Christmastide music program on December 3. The theme for this year’s program was “The God Who Gives.” It focused not only on the gift of Jesus Christ, but on “our responses, such as gifts of service, praise, and obedience,” said Dr. Helen Van Wyck, professor of music. The Christmas celebration included many of the College’s music groups, congregational singing, and Scripture readings. Choir performances included contributions from the Gospel Choir, directed by James Palmore; and the Concert Choir and Honors Ensemble, both directed by Professor Van Wyck. Instrumental performances included pieces from the Brass Quintet and Wind Ensemble, directed by Dr. Ken Austin, professor of music; and the String Ensemble, directed by Matthew and Emily Mantell. 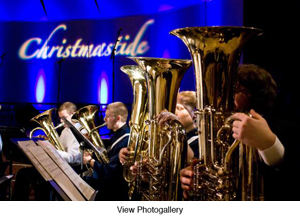 Christmastide not only brings a variety of audience members together, but also brings all of the Trinity’s music groups together – something appreciated by performing students.